James Leachman, my father, was the son of Henry Leachman of Nassagaweya and his wife Jean, nee Hume, of Arkell who farmed near Arkell and then retired to Aberfoyle. James, the subject of this sketch, lived from 1902 to 1973, living in Aberfoyle from his late teens. Known as “Jimmy”, he apprenticed with Aberfoyle blacksmith James Gilmour. Jimmy Leachman worked at his trade in Aberfoyle for 33 years, at the blacksmith shop that today is the Aberfoyle Snowmobile shop now owned and operated by my family. It is located on the east side of Brock Rd., a few lots south of Cockburn Street. At one time three blacksmiths operated in the shop. The chimneys remain in the south wall of the shop - former stations for blacksmiths in the days when horses were still used on area farms. Jimmy had a great sense of humour and loved to tell a joke. He also had a quick temper, which was often exercised in a string of expletives, but he never held a grudge. Once his anger was vented, all was forgotten. Dad smoked a pipe but found it easier to chew tobacco when working. I remember being sent across to Lewis's store to buy a plug of tobacco for him, and stopping to sit on the ring of benches Cecil Weekes had built around a large maple tree in front of his property. I bit a corner off of the plug and proceeded to chew. I was pretty green by the time I reached the shop and dad could tell what I'd done by looking at the plug minus a corner and then at me. He figured I'd learned my lesson without any need for more punishment! In my father's time, horseshoes and nails were purchased by the barrel for the shop. However, he could forge custom shoes if an unusual size was required. Besides shoeing horses, he made small tools and wheelbarrows, fitted wagon wheels and repaired farm machinery. 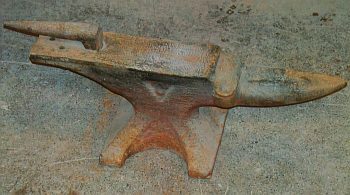 I used to help my dad repair ploughshares and flatten wagon rims, by throwing the smaller hammer in opposite rhythm to his throwing a full-sized sledge hammer to shape them. Out front of the shop there was a flat, steel ring with a pit in the middle where he placed the rim. He would set little sticks around the perimeter and light a fire to heat the wagon rim. Two people with pliers would then lift the rim and set it on a spoked wagon wheel to cool and contract around the wheel. He also had a rim stretcher that I helped him use. Like other area blacksmiths, Jimmy was often called to Guelph to shoe the horses used to pull the delivery carts by the local dairies – Royal Dairy, Victoria Dairy, Crown Dairy. These horses were shod with special rubber shoes. Dad married Margaret Black, a daughter of Peter Black and granddaughter of William Black who owned a farm just south of Aberfoyle on Lot 23, Front Concession 8. Being a “smithy” was Jimmy's occupation, but he did a little farming on the side. He and Margaret lived in Aberfoyle, in the white stucco house just north of the house on the corner of Cockburn Street where Cecil and Almira Weekes lived. He kept the family's horse and milk cow in the small barn still standing out back, on the street across from Aberfoyle School, and finished pigs, sheep and goats as well – whatever he had taken in as "payment in kind", a common practice in rural communities. Margaret's brother took over the Black family farm on the death of their father Peter, but when her brother died she inherited her family's farm. When there was no longer a need for blacksmiths in Puslinch, Jim Leachman worked for another 14 years as a blacksmith for the Ontario Agricultural College. After his retirement from the O.A.C., Jim and Margaret moved to the Black farm where they lived out their lives. Today the Black/Leachman farm is the site of a new housing enclave on the east side of Brock Rd. in the village. The brick farmhouse and barn are still standing and my father's blacksmithing tools including the forge he used before W.W.II are stored in the barn. The stack and coal unit that attached to the forge have also been preserved. After the shop had been wired for electricity, an electric forge was used and it too has been kept. The anvil seen in the photos of him plying his trade remains at the snowmobile shop today. Researched by Lynn Crow, Puslinch Historical Society.